First of all, I think we can all agree that this is the shittiest week ever, at least if you live in the United States...particularly Boston or West, Texas. I mean, what the hell? That being said, I am going to post about something completely frivolous and optimistic in an effort to wash my mind of this weeks events, if only for a few minutes. So bring on the wedding chatter! Tony and I have been looking at engagement rings lately (Read: I've been looking at rings and sending them to Tony) and have decided that it might be more prudent to go thrifty on the ring...you know, so we can actually afford to get married. Not to mention all the other things in life we need to deal with, and by that, I mean pay for. I've been scouring the internet for the best and most beautiful deals and I think I've found an amazing selection. I've been looking for amethyst in particular, since it's my birthstone, but there are some really beautiful options out there. In fact, all of these rings are well under a thousand dollars, so if you've got the cash, all of these would also make fantastic right hand or cocktail rings. I'd be lying if I didn't say I booked marked a few of these for when I have some spending money. those are all so pretty! Hope you get one soon! They're so pretty! I wish there were more affordable engagement rings that looked so luxurious. The big fault I found when I was hunting for engagement rings was that the more exclusive they were the less affordable engagement rings became. So I settled for one of gorgeous but cheap gemstone rings & I loved it! Nice rings. I like your blog. Thanks for the blog you have share with us. Beautiful! 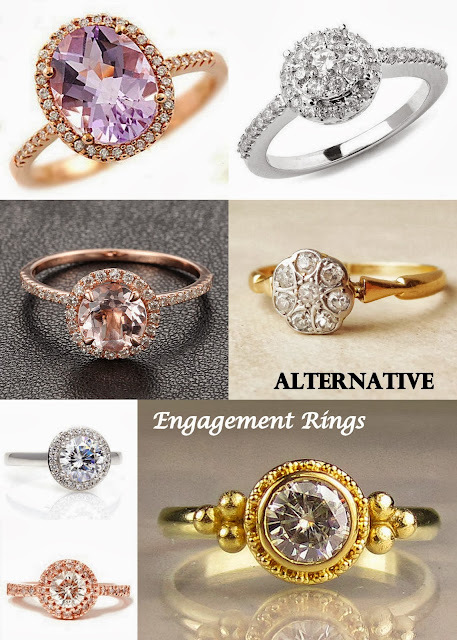 The engagement rings displayed above are really very pretty and charming I must say. Although all are beautiful, but I like first one the most. This is a perfect engagement ring with sparkling stone. I really like the design. Actually I am searching for a ring for my engagement and I will definitely customize my ring in the same design displayed above. Thank you for displaying such wonderful collection of rings.